It has been quite the year for baking projects. I just wanted to take a quick moment to wish all of my dedicated readers a happy new year! Pretty soon I'll post my culinary resolutions for 2011, but today is all about celebrating. For our celebration I decided to make one of the desserts from Around My French Table by Dorie Greenspan. As my readers know, I think she is one of the Goddesses of Baking, and I was really looking forward to this cookbook. It hasn't disappointed me, and I'll review it soon once I've tried more recipes from it. On to the cake! I chose the recipe for Michael Rostang's Double Chocolate Mousse Cake because she says that it is one of her favorite desserts, and I loved that you could serve it three different ways. The entire cake is made out of chocolate mousse, and first 1/3 of it is baked as a sort of crust. From there you can do three versions - one where you pile the rest of the mousse on top and serve it as is (but chilled), one where you bake the rest of it and serve it warm (still with two layers), and the last, which she said she preferred, where you bake the two layers but then chill it before serving. I wish I'd had the pan the recipe calls for, because I only had a 10 inch springform, so my layers are quite a bit thinner than they should have been. Other than that, I always trust Dorie's judgment, and served it the third way. It was delicious - creamy and rich! I was worried it would taste just like a flourless chocolate cake, but it is a lot lighter than that in texture, and the bittersweet chocolate did not taste too bitter (and I sometimes find that to happen). What did you make for your holiday? Back on January 2nd of 2010, I decided to make culinary resolutions for the year. I figured with the amount of time I spend in the kitchen, and the fact that I love baking, would mean that finally I would be making resolution I could keep! Wrong! So wrong! Well, at least not all of them. I have listed the original goal in italics and discussed whether or not I followed through, and if so, how. Other than pizza dough, I failed on this resolution. Pizza dough doesn't count to me because I've made it before for a Daring Baker Challenge, and continue to make that recipe frequently, as it was perfect. Not too long ago I made pizza dough from a different recipe that was the final straw for my mixer. I've made several sweet yeasty things, but that was not the resolution. Well, um, my Mom sent me my cake decorating supplies in November, and that is as far as I really got. I did get inspired to do some chocolate work as a cake decoration, a fairly easy technique that I tried again for a baby shower. Otherwise, I seemed to make cakes that didn't need decoration. I made cakes, okay? Just not pretty ones. There was the mocha study day cake, my diva chocolate cake for my birthday, Racines Cake from David Lebovitz's new cookbook, and many others. Full confession - I've had my old cake decorating supplies plus another box of pans of all shapes for two months and they remain unopened. Guess what is going on next year's list!? This year was the first year I had a garden, so I had seasonal ingredients up to my eyeballs, but not a lot to bake with (until I get more into savory baking, see #2). However I still managed to do a good lot of baking with seasonal ingredients. My rhubarb fling included strawberry rhubarb pie and a rhubarb tart, but my raspberries that started out so promising were completely devoured by Japanese beetles, as were most of my strawberries. July saw blueberries (some from my own garden) being made into crumb cake and breakfast cake. I did manage to throw my own herbs into a sweet/savory sweet potato pie. During Apple season, I actually went to two different apple orchards around the Hendersonville, NC region. Part of the trouble is I often repeat recipes I have always made, and didn't photograph everything. I made my Grandma's apple cake recipe, crock pot apple sauce, and then did manage a few new things - caramel apple cake, Nick Malgieri's Breton Apple Pie (so pretty), and a Torta di Mele for the November Daring Bakers Challenge. I did discover in all of this that I have a new favorite baking apple - the mutsu! It is firm like Granny Smith but not as tart, and I adore it. So despite my apparent bypassing of peach season yet again, I feel like I accomplished this culinary resolution fairly well. Despite my failings, I feel like I kept these in the back of my mind throughout the year. What is a resolution for, after all? I may need to make the cake one more specific or narrow if I want to continue with it, but stay tuned for 2011's culinary resolutions! One of the luxuries of the holidays, at least for me, is getting to do leisurely baking projects, even if something takes three hours on a morning before we can eat it. Who cares? There is coffee, there are books to be read, and snow to watch. This year Nathaniel wanted cinnamon rolls for his birthday, and so I went off hunting for a good recipe. 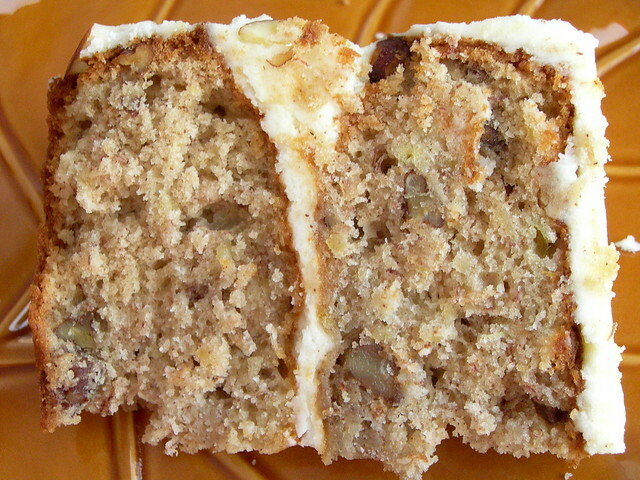 I wasn't enamored with the one I made back when I worked at a bakery, as it was rather bland. Sticky buns came up because I made them back in 2007 for another Daring Bakers Challenge, but they destroyed my oven and I wasn't anxious for a repeat of that mess. Plus they really do depend on nuts to balance out the sweet, and I was hoping for something more tender. 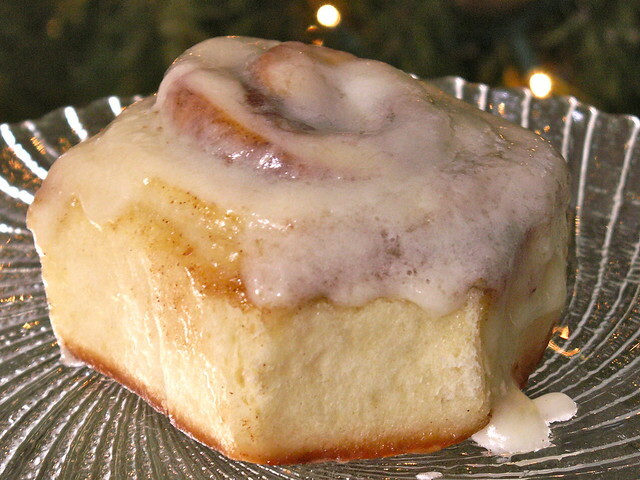 I ended up just doing a search for "best cinnamon rolls recipe" in Google and found two contenders - Alton Brown's Overnight Cinnamon Rolls and a Cinnabon Copycat Recipe. When I'm going to make a recipe from an internet site for the first time, I take advantage of the reviews. I knew both of these recipes were probably good because over 300 people had reviewed each of them and they still were five stars, which is always a good sign. But I was seeing some trends in the recipes. There were several comments that Alton's recipe was too dense, that they ended up too hard, too browned. I didn't want to risk it, as I really wanted a tender recipe. The reviews with the other recipe mainly took issue with the directions, which were terrible, not even including information proofing the yeast or a second rise, but said that with the correct steps the recipe itself was good. I also didn't want to use margarine, and thought some of the ingredients needed to be clarified. So with no further ado, here is the recipe that I used. The ingredients come from the recipe on Food.com, but the directions are mine. 1. In a small bowl, heat milk until pleasantly warm, not hot. Sprinkle yeast over and let dissolve, about five minutes. The mixture can be stirred if some of the yeast on top isn't mixing in. You want to see it become a little gooey, maybe with a few bubbles on the sides, to make sure the yeast is working. 2. In a large bowl, combine flour, sugar, salt, and mix briefly. Add in melted butter, milk and yeast mixture, and eggs. Mix with wooden spoon or paddle mixer until incorporated. Switch to kneading hook or remove mixture to a floured surface. 3. Knead dough for 5-8 minutes by hand, or in a mixer at low speed for 5 minutes. Dough should be soft but not sticky, and hold an impression when it is poked. 4. Lightly oil a bowl. Place dough inside, first covering the top in the oil. Cover the bowl lightly and let it rise in a warm, draft-free place for 2 hours, until doubled in size. 5. Punch dough down. Roll out to a rectangle, about 21-24 inches by 16 inches. Spread softened butter out on dough. Cover entire surface. Sprinkle with brown sugar and cinnamon mixture, except for the last inch along a long side. It will be pretty thick, use all of it and pat it down evenly. 6. Roll tightly from the long side that has filling to the edge, ending with the piece just with butter, and use that to seal the tube. Rest it on this part to slice. 7. Slice 1-inch rounds, discarding the very ends if desired. Place in greased pans - one 9x13 or 3 cake rounds, leaving room for dough to expand. At this point the dough can be covered and chilled overnight, and taken out for an hour before baking. If you wish to bake immediately, cover and let rise until double or at least poofy, 1.5-2 hours. Remove the covering before baking! 8. Preheat oven to 350 degrees F. Check after 10 minutes. Depending on the thickness of the rolls, you will probably need 5-10 more minutes. I like to take mine out when they are just getting to be golden brown on top and are barely cooked through inside (but not doughy). 9. While they are baking, mix the icing together until smooth. Spread on rolls immediately when they come out of the oven. Serve hot! Okay, it isn't what you think. This is not a happy birthday Jesus cake. My husband Nathaniel was born on December 24th, several years ago. 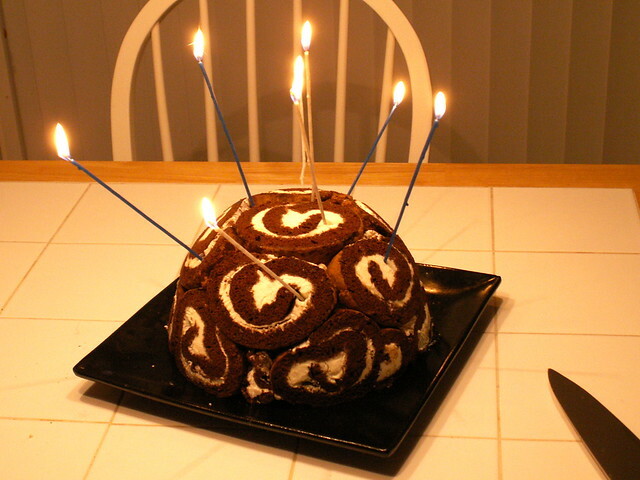 For years and years, his yearly birthday cake was the chocolate chip mint roll cake from Baskin-Robbins. Back in 2007, I begged him to let me make something better, but that pretty much failed. This year, he had already agreed to let me make his cake before learning that all three Baskin-Robbins in Greenville closed. I wanted to still pay homage to the chocolate and mint combination, so I used a Mint-Chocolate Roulade recipe from Southern Living for the cake part. I've been obsessed with Charlotte Royale since considering it for the Daring Bakers challenge I hosted (I ended up picking cheesecake), and I often return to this beautiful Charlotte Royale on Axis of Aevil. I didn't even read their directions, just modeled what I was doing after their pictures. I froze the roulade to make it easiest to slice, then lined a random bowl with plastic wrap and then slices of the rolled cake. Inside are three pints of ice cream. The one at the top is Haagen Daaz Mint Chocolate Chip. In the middle is Ben & Jerry's Coffee Heath Bar, and on the bottom is Ben & Jerry's Chocolate Chip Cookie Dough. True, I could have really been challenged by making my own ice cream for this, but I wanted it to be good, and I haven't really sorted out the texture in my homemade ice cream yet. I thought this was terrific! At the end of the day it isn't that time consuming, particularly if you use store-bought ice cream like I did. 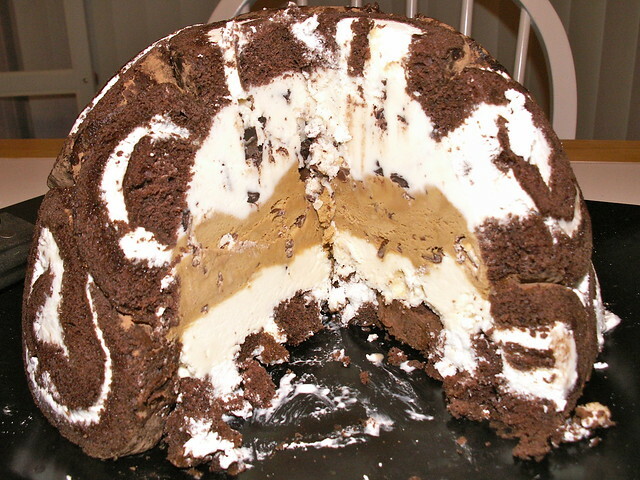 If I made it again, the one thing I would change is the filling for the roulade. I made whipped cream and it turned pretty icy in the freezer. After the fact, I realized this was almost exactly what the July Daring Bakers Challenge had been, even though I missed it. To show I was at least trying to do the recipes, here are my required blog-checking lines - The July 2010 Daring Bakers’ challenge was hosted by Sunita of Sunita’s world – life and food. Sunita challenged everyone to make an ice-cream filled Swiss roll that’s then used to make a bombe with hot fudge. 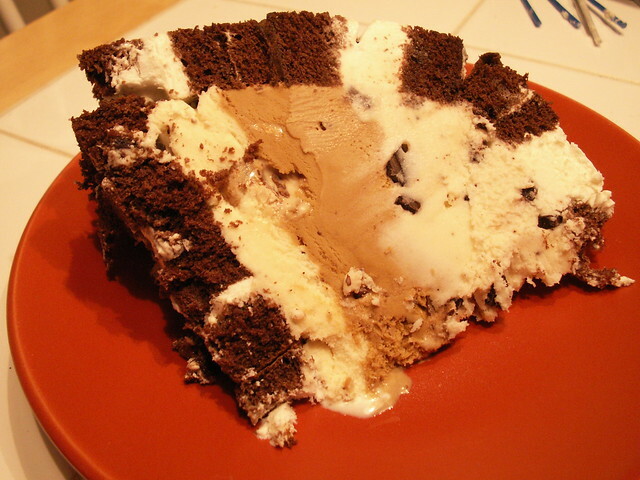 Her recipe is based on an ice cream cake recipe from Taste of Home. I enjoyed this challenge! I knew I would need to bake this for people other than the man I married, who refuses to eat fruit in bread. Haha! 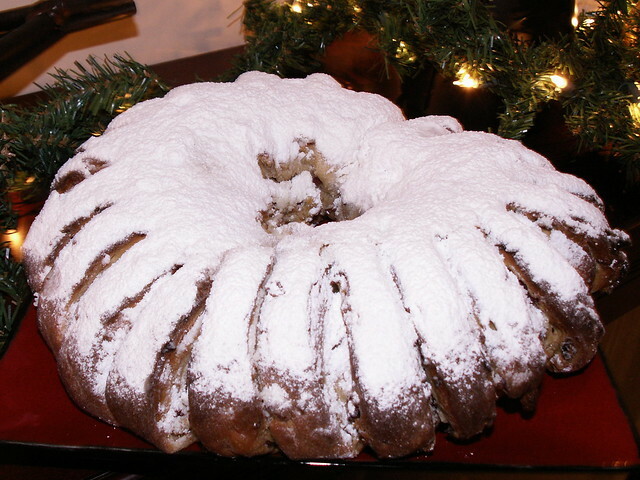 Luckily my work holiday party was last Friday, so I planned to bring a stollen wreath as my contribution (we do potlucks or pitch-ins now, which works great because we have a lot of great cooks in the library!). I'm still not a master of yeast breads, but I really enjoyed working with this dough. It had a great feel to it, and I kneaded it by hand. I recently spent $150 getting my KitchenAid repaired and I'm too nervous to have it do any heavy labor. That's okay, because I actually enjoy kneading the dough, and I think I get a better sense of when it is ready when I'm touching it. The major change I made with the recipe was simply in what fruits I used. 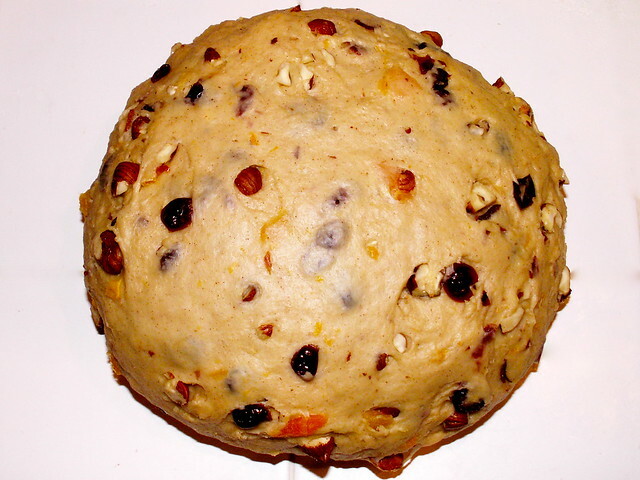 I substituted dried cranberries for the raisins, and used dried apricots rather than citrus, although I kept the orange zest in the recipe. I also didn't have rum, so I soaked the fruit in a mixture of Grand Marnier, orange juice, vanilla extract, and almond extract. I also used Oregon hazelnuts, roughly chopped, because I have a bunch to use and I love their flavor! The picture of the slice is a bit blurry, because I'm still getting used to a new camera. 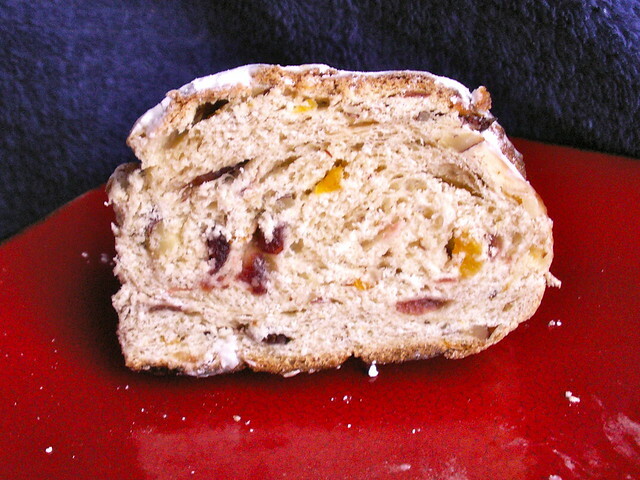 I loved the tenderness of the stollen, and how it could have so much flavor while still being dense and rich. I snagged a bit of the leftover to take home to play with, and it was great toasted! Then someone in the Daring Kitchen forums mentioned that they were going to make french toast, and I thought that was a great idea! I'm a fan of using what I have on hand, so my custard was made from eggs and Silk nog that I needed to use up, and it made my fruity stollen into amazing french toast! I talked Nathaniel into trying a bite. I thought it was so delicious, not dried out like some store-bought stollen I've tried, that surely the fruit would be secondary to the sheer beauty of the stollen I had made. Hahaha. He looked like he wanted to scrape his tongue off. I wanted him to have a good experience with it, and had an idea about infusing extra flavor into the dough during the milk scalding stage, so I pledged to make a version without any fruit or nuts. I also read a bit more in The Bread Baker's Apprentice, and Peter Reinhart pointed out that the formula for stollen dough is almost identical to that of panettone, meaning you should be able to use the doughs interchangeably in the various shape options. This sparked another idea, of making little individual panettone with my new dough. While the milk heated, I added a cinnamon stick, and also added some instant coffee to it before it cooled down. I added about 1/3 cup of chocolate chips and cinnamon chips to the dough while I kneaded it, and these all melted and made ribbons of darkness in the dough. I added an additional 1/3 cup of the chips to the various portions of dough before forming it. I made half into mini-panettone (using Reinhart's idea of just putting them in a muffin tin), and the other half into one typical stollen loaf. Oh how I wish it had turned out! The coffee and cinnamon were pretty much in the background, and except for in the bites containing chocolate, the dough lacked the richness and moistness of my first stollen. I should have found a way to compensate for the alcohol-soaked fruit. I could tell the dough was too dry, but in my head this translated to it not needing to bake as long. Bummer. 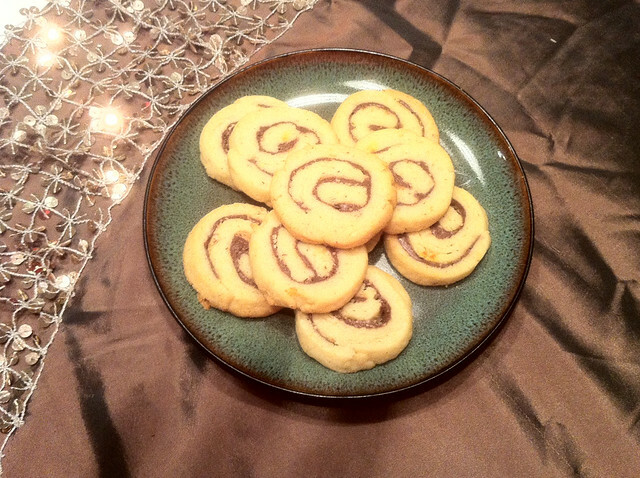 Over a year ago, I saw a recipe for Orange Nutella Pinwheel Cookies, and bookmarked it for "later." It made such an impression that it was in the back of my mind as I started planning for holiday baking this year, and I went back to look for it (here is another blogger who made them without the orange, and her pictures are stunning). The dough for these is a little persnickety, but the end result is so good! And the first time you slice your knife into the chilled pinwheels and see how perfect they look, you will know it was worth it. I changed the recipe a tad by using almond extract (by necessity, I was out of vanilla, but I think it was a nice touch), adding some ground hazelnuts to the batter and decreasing the flour slightly, and sprinkling ground hazelnuts on top of the nutella before rolling up the dough. I will probably add this to the holiday cookie list. This year, I made two batches instead of making sugar cookies, gingerbread, or wagon wheel cookies! 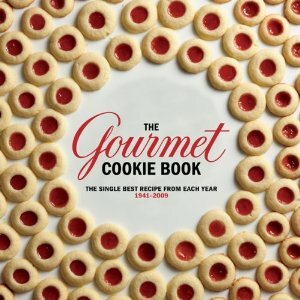 I think if I had my way, this cookbook would be called the Gourmet Retro Cookie Book instead of just the Gourmet Cookie Book: The Single Best Recipe from Each Year, 1941-2009". I loved the idea of having one representative recipe from each year for almost seventy years, and it was really interesting to see words change (cooky used to be the preferred spelling, crazy! 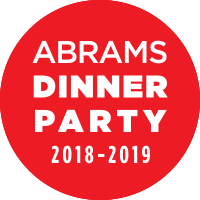 ), recipe layout change, and how technology has made some recipes that used to be complicated so simple. The recipes are printed as they were printed in Gourmet Magazine through the years, but each one has editorial notes. I found these to be very helpful, often including information on using appliances that didn't exist when the recipe was published to make it easier, as well as hints as to what a step should look like, a shortcut, a substitution, or freezing/bulk suggestions. I definitely followed some of the editorial suggestions in both recipes I made, and they added a lot of clarity to the process. The pictures in the book are interesting too - everything is an aerial shot, very simple, but it is always nice when a cookbook has a photo for each recipe, and this one does. 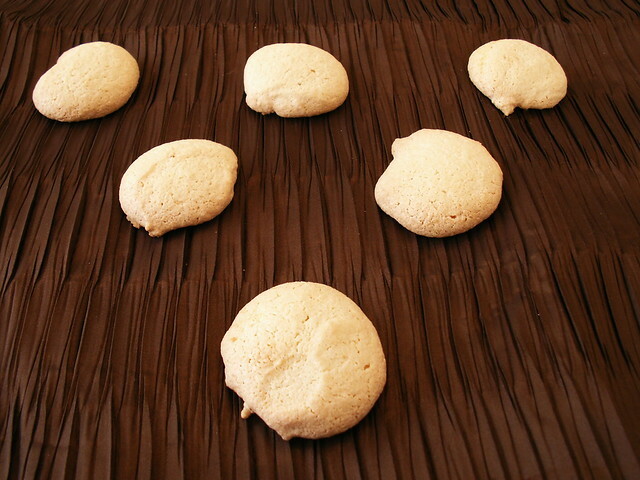 The first recipe I made from the Gourmet Cookie Book, was the very first recipe, Cajun Macaroons, from 1941. I'm still not quite sure what makes them "Cajun," exactly, but they appealed to me because I had egg whites in the fridge and almond paste in the pantry, and beyond that they only required three more ingredients. These cookies were fantastic. They look a little bland, but they have so much flavor, and an interesting texture with a crunchy outside and chewy centers. 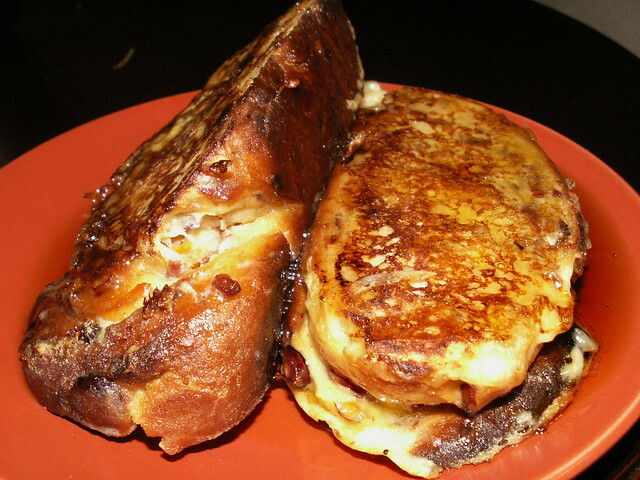 Super easy in my food processor, and I'd make these again in a heartbeat. 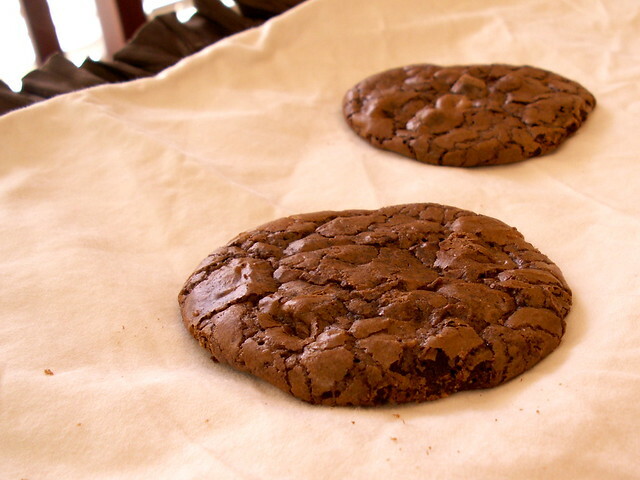 The other recipe I made was from the 1990s, Mocha Cookies. According to the Gourmet Cookie Book, the 90s were the chocolate decade. 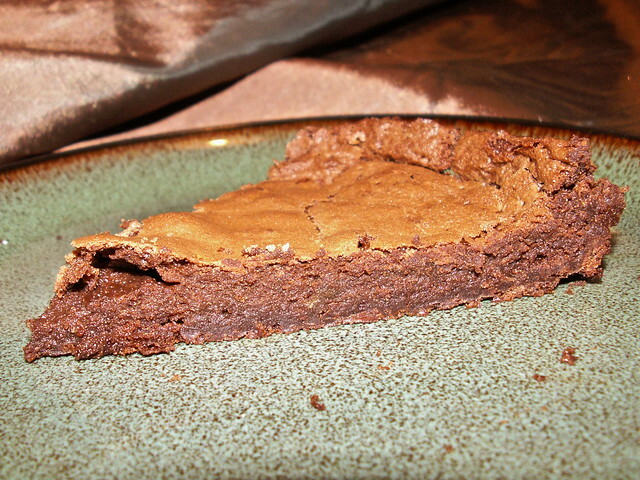 These are shamelessly rich and super addictive, and I will make these again for sure. My only complaint is that the recipe makes it sound like you should mix them as little as possible (I always assume that with the "fold" word instead of "mix") but I had a few that didn't taste sweet at all because the unsweetened chocolate was the prominent ingredient. So when I make these again, which is going to happen for sure, I'll just mix it all a little better. I wondered if buying this cookbook was redundant, because so many recipes from Gourmet magazine are traditionally available on Epicurious.com. But from what I can tell, the recipes on that website don't go back this far, and I couldn't find either there. This is a great retrospective cookie recipe collection that I think is a great addition to any kitchen. And honestly, who doesn't feel a little nostalgic about the demise of Gourmet Magazine? 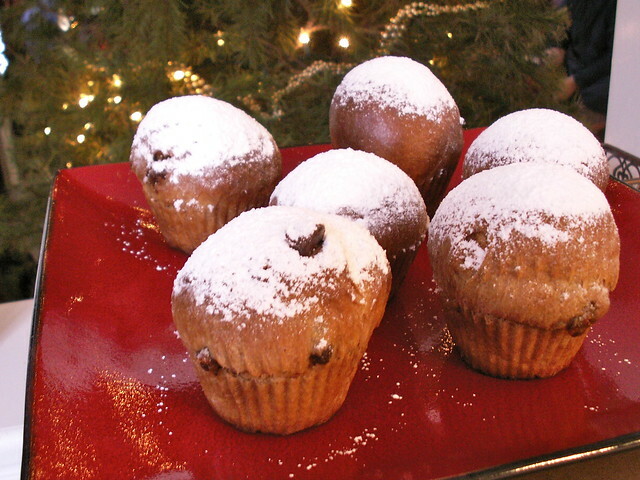 Retro... nostalgia... it suits baked goods somehow, especially during the holidays. And just for full disclosure, I did get access to this title through NetGalley, so thanks to them for letting me take a look!